Shopping is a favourite hobby for many and if you are like us here at the Inverness Palace Hotel & Spa it’s a bit of a passion. Below are the main shops in Inverness and also off the beaten track to some more unusual shops. The biggest Eastgate Shopping Centre – with Debenhams, Marks & Spencer, Starbucks, USC, Monsoon, Jones Boot makers, Laura Ashley, Next, Phase Eight, Pizza Express, HMV and lots more it is the indoor shopping centre for Inverness. The traditional Victorian Market – for a unique selection of shops it is the perfect place for gifts or something a little bit special. We recommend Story Belgian Chocolatiers -fab gifts including chocolate nessies. Plus lots more from music to jewelry – step back in time. The High Street Inverness – not to be forgotten Music Shops, great shoe Rogersons Footwear and Beggs to Toni & Guy hair salon. For the guy’s there’s lots of sports and outdoor clothing shops and Slaters Menswear too. There are also Farmers markets & Winter Festival Markets. Inverness Retail Park – for all the big names from New Look, Boots, Mothercare, Bank Clothing, Clarks, Next, Vue Cinema and more. Garden Centres the award winning Simpsons Garden Centre, Dobbies Garden Centre and Howdens Garden Centre are all just outside Inverness city centre. Leakey’s Second Hand Bookshop – This is THE place to try in Inverness if you like books and / or a great bistro-style cafe with home cooking and an open fire! Leakey’s Bookshop was established in 1979 and has been housed for the last 19 years in the old Gaelic Church (1793). It is Scotland’s largest secondhand bookshop with 100,000 selected volumes. Castle Gallery one of the most successful small galleries you’ll find in Scotland. An alternative is Riverside Gallery a family run gallery with exhibitions all year. For all things kilt related see Highland House of Fraser with the Scottish Kiltmaker Visitors Centre offering bespoke Kilt Making for 50 years. 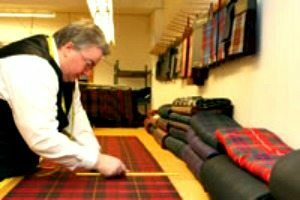 Or Chisholms Highland Dress a family run kilt business looking after all the details for generations. The Highland Bottle Shop – a locally owned independent shop in Inverness opened in 2013 with a hand selection of craft beer, malt whisky, small batch spirits and unique malt whisky. Just some recommendations for local Coffee Shops around Inverness and more below in the Shopping outside Inverness. Girvans Restaurant – a family run restaurant serving lovely meals and cakes its very busy. Coffee Affair – on Church Street a fresh and friendly local Coffee shop with a great selection of cakes and freshly made sandwiches. Recommended by Helen via Facebook. Rendezvous Cafe on Church Street a smaller more quirky cafe serving homemade and local produce with about 10 tables it’s busy and has friendly staff. New – Perk Coffee & Donuts on Church St on Church Street again a small cafe serving Barista coffee and hand-crafted donuts. New – Coyote Artisanal Coffee & Donut Bar– intimate coffee bar with a fabulous selection of homemade donuts on Academy Street. Cobbs Café at Inverness Botanics for a tempting selection of home-baked cakes, soup, sandwiches and light snacks. The has a sunny terrace overlooking the gardens providing the perfect spot enjoying all the flowers. Recommended by Helen via Facebook. Corner on the Square Deli in Tiso the outdoor Sports Shop on the Longman Industrial Estate. Simpson’s Garden Centre has a great self service restaurant and live music at weekends. Ice Cream Parlour – Miele’s Gellato offering an ever changing selection of delicious ice creams on Church Street, Inverness. As well as the local shops there are also a great selection of unique shopping experiences near Inverness so here are some easy links and many offer great coffee and cakes too! Bad Girl Bakery in Beauly – inspiring and creative bakery in the small village of Muir of Ord. Great photos on facebook so see facebook.com/badgirlbakery/ – they also have a pop up trailer on Falcon Square in Inverness – not to be missed! Corner on the Square in Beauly – another great coffee shop and award winning Deli. Robertsons Larder and Kids Farm just outside Beauly with a Kids farm too! Hardmuir Fruit Farm – located close to Nairn it is open from June to Dec with a Farm Food Shop and a Pick your own fruit and veg. Picnic tables for nibbling on the fruit you’ve just picked. Connage Highland Dairy – fabulous cheese makers, coffee shop and cheese pantry too! North to Ullapool SmokeHouse – at Ullapool Market! Brodie Countryfare between Forres & Nairn – with womens, mens, kids, toys, home and more it stocks major brands like UGG and has a lovely restaurant too. Johnston’s of Elgin Cashmere Shopping Village – offering gorgeous womens, mens, baby clothes and new home collections plus a free tour of the factor and Coffee shop – great for a visit. Baxters of Fochabers – famous for all Baxter produce and restaurant too just enjoy your visit and the lovely freshly made highland food! Storehouse of Foulis – 17 miles north of Inverness on the coast of the Cromarty Firth you’ll enjoy a fabulous restaurant from breakfast to a light supper of homemade delights. Then visit the Farm shop for local produce and gifts. A local delight well worth a visit with lovely views. Munros Nurseries Coffee Shop by Munlochy (North Kessock) a hidden gem of home made cakes and delights only 6.5 miles from the Palace over the Kessock Bridge and lovely plants too – recommended by Helen via Facebook! The Coffee Bothy in Golspie – lovely coffee and the cakes are a work of art. Just 52 miles north of Inverness in the lovely town of Golspie – recommended by Faith via Facebook. Waterlines Visitors Centre, The Harbour Lybster – for the very best crab rolls with stunning views – 90 miles from Inverness on the Caithness coast not to be driven by! Recommended by Alison via Facebook. Fiddlers – Coffee Shop & Restaurant in Drumnadrochit (Loch Ness) ideal if you want a break from Nessie hunting. Also offers Fiddlers Whisky Bar and Beer Cellar. Dores Inn – a lovely pebble beach on the Inverness side of Loch Ness only 10 miles from the town centre it is ideal for kids dipping their toes into the loch and the Inn provides delicious food year round. A great stop for any time of year. Dores on Loch Ness. Foyers Stores & Waterfall Cafe – 10 miles south of Dores on the quieter eastern shore of loch ness the village is just under a mile’s walk from the pier to through steep woodland where you’ll find a the highland village Stores & Tea Rooms. Take the walk to Foyers Falls and enjoy the many woodland trails. Camerons Tea Room & Farm Shop – for fresh home baking, home made soup and close up viewing of Highland cows Camerons Tea Room is rated no.1 on Trip Advisor. Find it on the south side of Lochness near Camerons Holiday Cottage. The Dairy at Daviot – just outside Inverness on the A9 the Dairy offers a lovely Cafe ideal for a morning coffee or lunch. Also offers a delicious Sunday carvery too. House of Bruar – a great stop if you are traveling on the A9 north or south about 70 miles from Inverness this is shopping and dining heaven – lots of scottish produce and many different shops to browse through makes a great stop off on the way up or on the way home. We’ve even been known to go down just for Sunday lunch!